Paithani saree is a very popular Marathi saree. The saree is from a town named Paithani in Maharashtra. It is well known for its hand woven silk sarees and its bright combination of colours. You can easy identify the original Paithani sarees by its characters and features. The characteristic features of these sarees are the peacock designed pallu with vibrant zari works. Kaleidoscopic design is another unique feature of this saree by weaving one coloured thread bread-wise and another coloured length-wise. Various other motifs are also available in the designer Paithani sarees. The border and pallu are the main highlights of the Paithani sarees. It is also considered as one of the richest saree that are available in India which is exported to various other countries as well. In case you are wondering what makes them a popularly sought choice, here are some things you should know about Paithani sarees. Paithani dates back to the Satavahana Dynasty who ruled between the second century BC and the second century AD. This fine silk handloom sarees get their name from the town in which they originated which is Paithani, located in Aurangabad, Maharashtra flourished during the era of the Mughals, particularly during the rule of Aurangzeb. He used to punish Jamdani weavers to encourage them to produce something creative and novewl, hence Paithani introduced various novelties in the appearance of the traditional Paithani. When the Paithani weaving industry experienced a setback with the Industrial Revolution and with the appearance of the British rule. In the 17th century, the Peshwas took the responsibility upon themselves to promote the craft, and consequently, settled Paithani weavers in Yeola, which is now the manufacturing hub for Paithani. From then on, Paithani experienced a new life. One of the specialties of Paithani sarees is while it is available in both six and nine yards, the most interesting part about the Paithani handloom is that both sides of the saree look exactly the same. Even the border and pallu! This is a sign of a handloom Paithani. Here, top 30 Paithani sarees designs with pictures that are illustrated with pictures which would surely attract you. This red Paithani saree has golden zari work polka dots all over the saree. The border and pallu has violet and pink flower designs. Border of this saree is quite broader that makes it look gorgeous with zari works. This traditional Paithani silk has a shiny texture that makes this piece of saree attractive. This new Paithani saree has light green coloured effect that is contrasted with multi coloured borders. It really has an appreciating outlook. Golden motifs are done over the green portion of the saree. Hand woven peacock designed border and pallu is the main attraction. The specialty of this saree is the gorgeous pallu and borders. 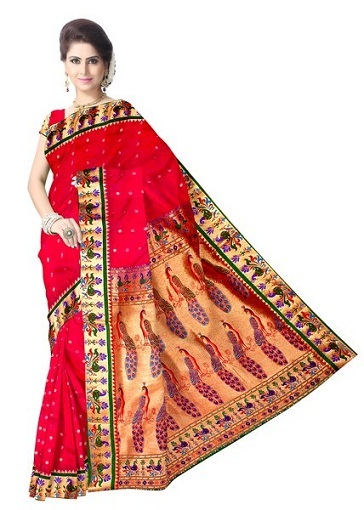 To have a contrasting look, pair this saree with red coloured blouse. In this Paithani silk saree, the main work is seen on the pallu section. The red and golden zari striped border runs all over this piece of saree. Particular traditional styled motifs are done all over the vibrant blue portion. The pallu is mainly golden threaded portion with different threaded floral designs. Shaded purple saree with golden works looks beautiful. This purple Paithani handloom saree has golden polka dots on it. The border and the pallu are designed differently with red and green meena works. These fine meena works are hand woven designs and have a traditional look. This is one of the best silk Paithani sarees. 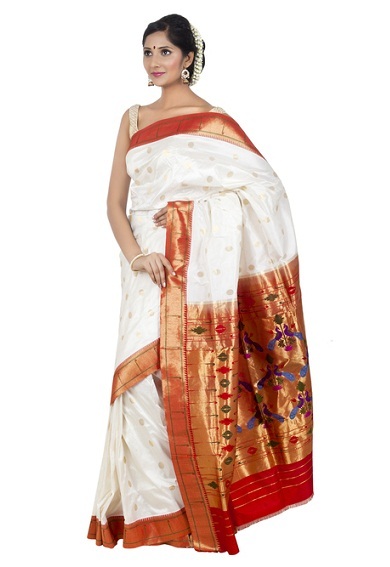 This off-white Paithani art silk has simply textured body with magnificent pallu. 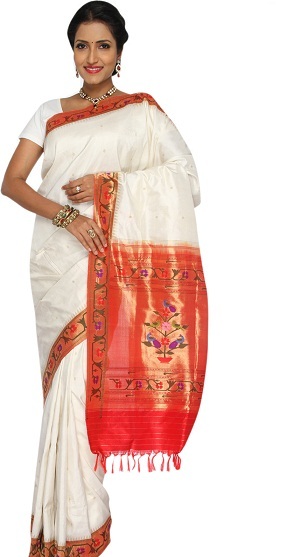 Simple golden border with sleek red lining on both the sides of the border runs along this off-white Paithani saree. Violet and green designs on the pallu seem very eye catchy. This can be worn in a traditional or religious occasions. This latest Paithani saree is sky blue in colour, one that is blended with a silky texture. You simply look gorgeous even in this light shaded saree. Wide zari borders are quite highlighted and the lower section of the pallu has the same designed multi coloured works. In spite of this the blue body of the saree has golden dots throughout the saree. 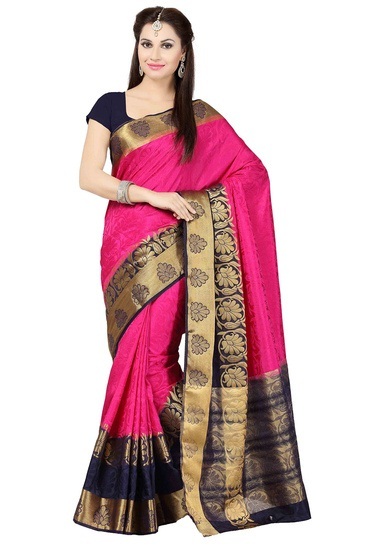 Self patch works are seen in this rani, dark shade of pink coloured Paithani silk saree. It is combined with plain golden borders. The pallu is contrasted with golden base and on it peacock designs are being done. Modern style is being combined with traditional Paithani saree looks elegant. This designer saree can be worn in reception parties. This Paithani saree has meena booties on the blue bodied portions. This dark shaded blue is combined with golden and red which have a reflecting look. Pallu has circular and peacock designs done alternatively. The enriching golden coloured pallu seems exclusive with green mainly. 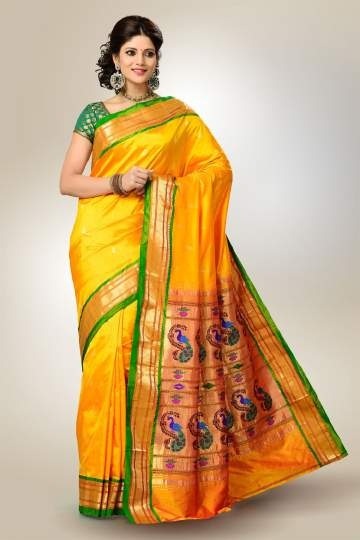 Mustard yellow coloured Paithani saree has looks beautiful with an orange border. Both the yellow and orange colours are quite bright and this outlook is also enhanced by zari works. Yellow sections have golden motif designs and the orange pallu has multi a coloured peacock design with golden strips. The golden zari strips also run along the orange border. This traditional Paithani white saree has orange designer pallu. It also has orange borders with zari works. The zari works along the border and over the pallu is really very eye catchy. You will surely like this unique designed saree. Nowadays white sarees are not only preferred by aged women, present generation ladies also chose this combination. Green and yellow saree looks very gorgeous with the colour combination. Even though its simply designed Paithani silk saree, the silky texture along with contrasting colours make this saree look absolutely elegant. Pallu consists of peacock styled designs with zari works and the border is of simply golden green designed. 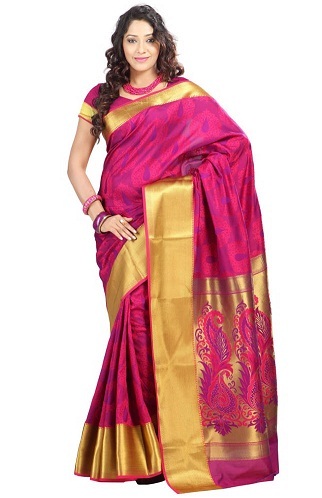 This Paithani silk saree has lustrous pink effect with uniquely designed pallu. This colour perfectly goes with ladies having fair complexion. The pallu has kaleidoscopic effect with multi colour. Borders have peacock designs with different colours and also with zari works. Try out this latest from the Paithani saree collection. 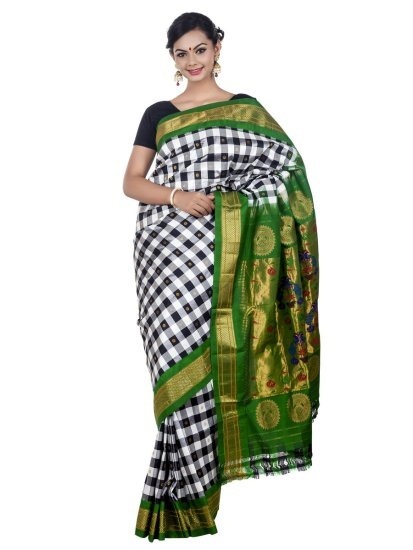 Check white and black design is seen all over in this peshwai Paithani saree. The check designs is the mixed differently with this Paithani silk. Green border runs along the saree with golden zari works. The pallu also consists of green portion with golden designed works. This latest Paithani saree design is classy and imparts a traditional touch. The vibrant colours of the saree is tomato red and blue. Both these magnificent colours look attractive with this combination in this piece of Paithani saree. 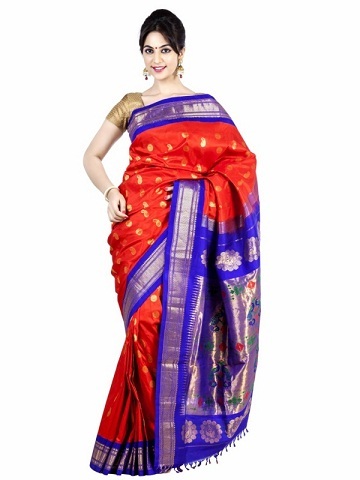 Golden motifs are being done all over the red portion and the blue pallu has shimmering golden works. This saree look absolutely elegant and you can pair this up with shimmering golden coloured blouse. 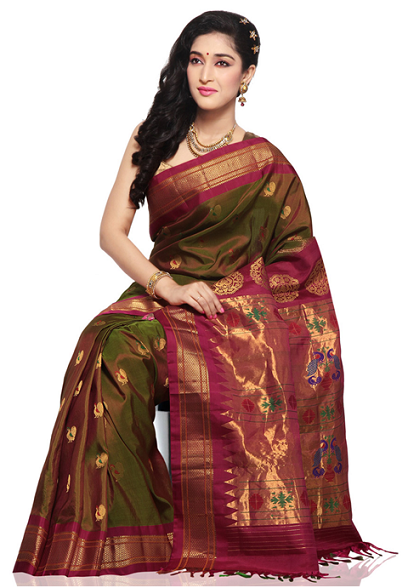 Dark green Paithani Silk Saree has small golden dots that enhance this dark shaded saree. Fine golden works are being done on the orange borders. 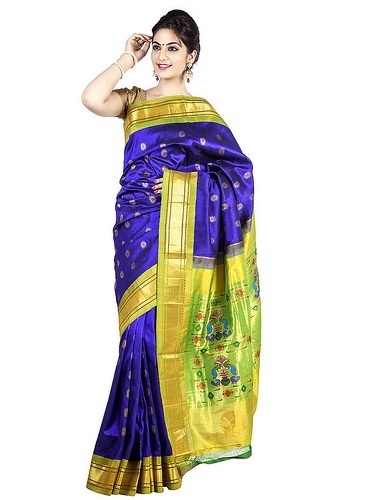 The shiny golden pallu has block designs in same colour combinations. This geometric pattern all over the saree looks perfect in you. Green blouse with golden motifs will complete the outlook. Black is always the preferred choice. This saree has a contrasting colour effect with golden and orange contrasting colours. Orange borders with fine zari works have a shiny outlook. Polka dots are all over the black saree except the pallu. Pallu having different style of designs makes you look attractive in this black Paithani saree. 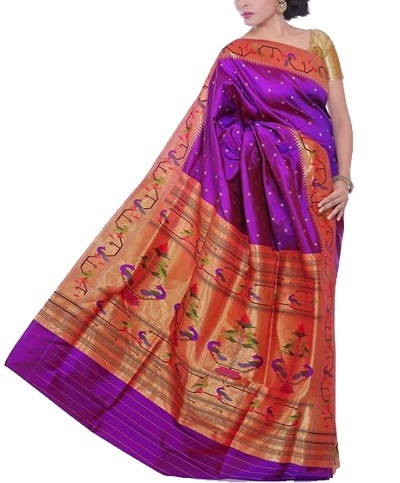 Violet Paithani silk saree has small dots throughout the body of this saree. 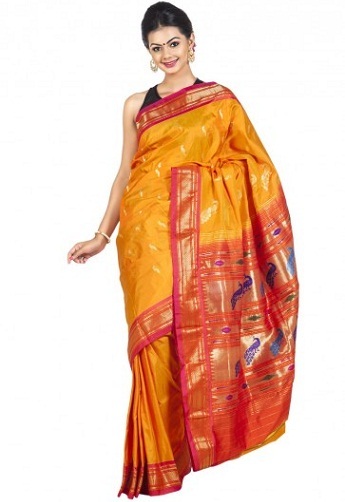 Orange and golden thread are being weaved simultaneously give the saree a shiny look. The fine textured Paithani saree has a vibrant outlook. The pallu is of orange coloured within this designer zari works are done. This semi Paithani saree has a highlighted combination. Parrot green border and pallu section is being combined with this rich blue Paithani silk. This saree has golden motif and the borders are being simply designed. The green pallu has different shaded green and blue works. This is one of the best paithani sarees. This art silk Paithani saree looks really magnificent with red coloured effect. This magnificent red colour suits all and this wedding saree has heavy designed pallu. Peacock styled designs are done along the lower half of the pallu. The borders are also designed in the same manner mainly in green and golden colours. This turquoise Paithani silk saree has an eye soothing effect. The borders and the pallu are designed differently. Golden yellow dots are over the turquoise part. The border has kaleidoscopic effect of blue and golden which is depicted simply. The pallu is made contrasting with the golden effect and on it multi coloured peacock styles are being done. This piece is a perfect one for a wedding and will attract the women with its magnificent works. Floral works are done along the border and in same manner the pallu is being designed with multi coloured floral effect. Violet is the min colour component of this Paithani silk saree that undoubtedly enhance the beauty of this saree. This handloom saree is of dark shaded has a kaleidoscopic effect throughout this Paithani silk. This dark shaded green also has a reddish effect as two different threads are weaved together. Golden motifs are done all over the saree. The red pallu has temple design over the plain border and also has peacock designs. 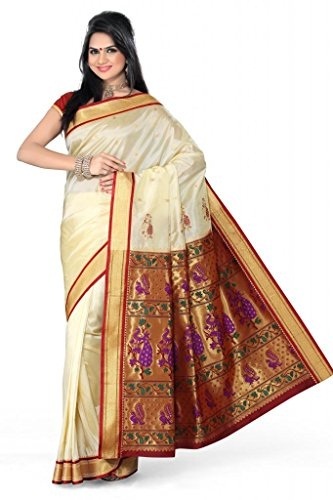 This white paithani saree has minimal designs over the body of the saree. It consists of green sleek designed border. The pallu has green hue over which designs are being done with multi coloured effects very finely. This saree is preferable to pair up with green coloured blouse. This is one of the best paithani sarees. Combination of red and white has traditional touch in it. This red-white combined paithani silk handloom saree looks very elegant. Most of the saree is left plain and simple except the border and the pallu. Fine works are being done over the pallu and borders. This is one of the best paithani sarees. Designer look of this paithani saree has a unusual outlook. The special touch is given in this saree by providing floral designs throughout this saree. It is a time taking handloom saree as it consists of very fine multi coloured designs. This is one of the best paithani sarees. Small booties over the white coloured base of this paithani saree provides elegance. The zari borders have peacock styled designs and an orangish effect. The divinity of this pristine white saree is really appreciable. You can add this saree in your wedding colour to add some traditional border and design. Self-design work over the white paithani handloom saree is a unique feature of this saree. This saree does not have heavy designs. The Self designed works looks simple. If you prefer simple designed paithani handloom saree, you must opt for this with brown and sea-green portions. Sea-green short sleeve blouse perfectly goes with this piece of saree. Pink is being combined with black which makes you look fashionable. This trendy pink saree has a lustrous effect. A black and golden coloured border has traditional patterned designs. 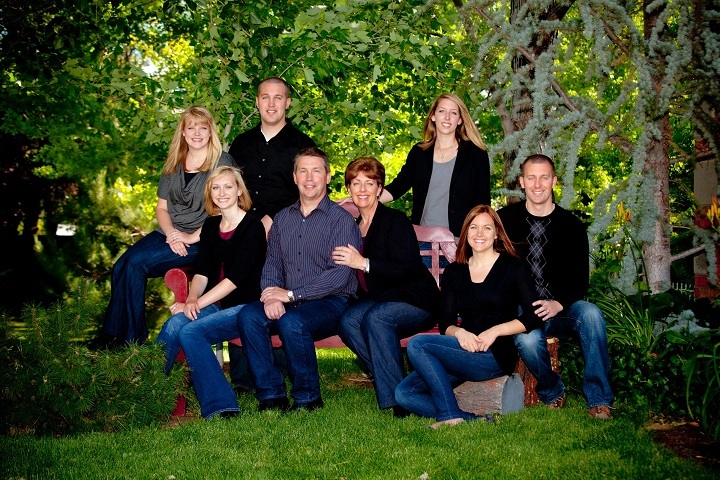 The lower portion has golden and black alternating sections that have a magnificent outlook. You can choose to wear a black designer blouse with this saree. This is one of the best paithani sarees. The kaleidoscopic effect of this saree looks awesome and vibrant. The shiny texture along with bluish-green kaleidoscopic effect enhances the brightness of this paithani saree. The light falling on this saree gets reflected in different directions resulting in different coloured hues. Magnificent orange pallu and borders are really very eye-catchy. This is one of the best paithani sarees. 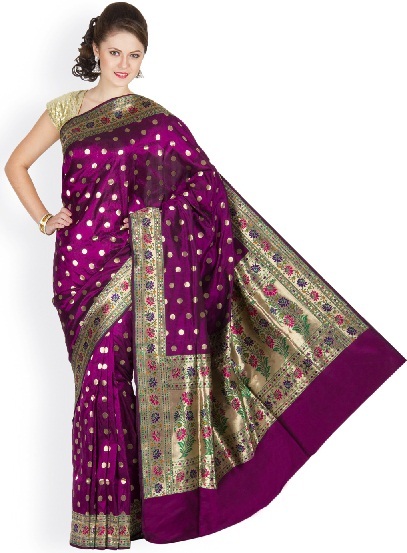 This dark purple effect of this saree is compensated with the violet and pink borders. Zari works along the borders highlights your saree. Pallu has the same designed works along the lower portions. This paithani saree design looks gracious and is bright. Simple or heavy designed paithani sarees are available in the market. This paithani silk handwoven sarees makes you look gorgeous with their zari borders and heavy designed pallu. Specialty of these paithani sarees are designed pallu with kaleidoscopic effect.